Join us for a fully guided 3-week climbing trip visiting some of the best ‘backcountry’ climbing areas in the rugged fold mountains of the Western Cape province of South Africa. We climb the buttresses and faces of some of the highest peaks of the region (up to 1995m) via long, classic multi-pitch traditional rock climbing routes, that date back as far as 1896. 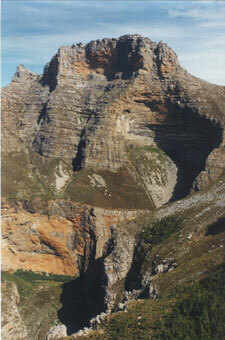 We climb Table Mountain, Du Toit’s Peak, Klein Winterhoek Peak, Milner Peak, the Cedarberg Tafelberg and Great Krakadou. Experience the full splendour of these mountains and the superb vistas out over the surrounding countryside whilst climbing this selection of classic routes on good quality quartzitic sandstone. These climbs are similar to summer Alpine climbing – usually long [ up to 3 hrs] steep approaches, sometimes up to high bivouac (bivy) sites, early start-ups, sustained multi-pitch climbing with a daypack and long (sometimes technical) descents. Climbing these routes will take you up into some spectacular settings and exposed positions, leaving you with a deep sense of satisfation and long-lasting memories. A scenic drive around the Cape Peninsula, including a visit to Cape Point; cragging at the excellent Hellfire Crags; spectacular mountain passes; wine tasting; Bushman rock art; Karbonaatjieskraal guest farm on the northern tip of the Hex River mountains, the historic and isolated missionary village of Wupperthal in the northern Cederberg. Savour a land of wide open spaces, fine weather and friendly people. Fly in to Cape Town. Meet your guide and drive to guest house accommodation in Cape Town. After settling in, take a scenic drive around the Cape Peninsula, visiting Cape Point, with the option of some climbing in the Silvermine area, or other accessible crags, on the way back. Overnight at guest house in Cape Town. Climbing on Table Mountain. 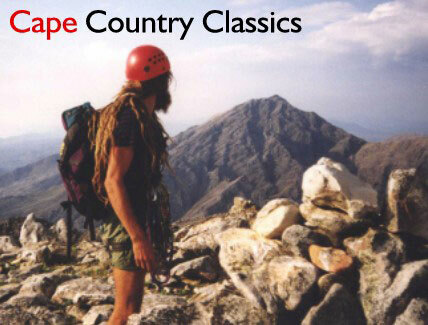 Climb the impressive north face of this famous mountain via one of the classics like “Right Face” (11), “Arrow Face” (11), “Africa Amphitheatre” (20) [min. 10 pitches]. Overnight at guest house in C.T. Leisurely rise. Drive out to the Du Toit’s Kloof at midday, unpack and have lunch at the Du Toitskloof Lodge. Climb at Hellfire Crags in the valley in the afternoon. Optional climbing at Hellfire Crags in the morning. Lunch at the Du Toitskloof Lodge. Walk in (max. 3 hours) to the bivy site beneath the North West Wall of Du Toits Peak in the afternoon. Overnight at bivy site, Du Toits Peak. Slog up the scree slope to the start of the route. Climb the “North West Face (Frontal) Route” (19) on Du Toits Peak [14 pitches]. Traverse off below the summit and descend via Currey’s Ridge back to bivy site. If time allows, pack up bivy and descend to the Du Toitskloof Lodge for the night. If not, start preparing brews and evening meal at the bivy. Overnight either at Du Toitskloof Lodge, or at bivvy site on Du Toits Peak. Rest Day. If still at the Du Toits Peak bivy, descend and go to the Du Toitskloof Lodge, to have tea/ lunch and to collect stored luggage. Drive via the Du Toitskloof Pass and the scenic and historic Bain’s Kloof Pass, to the historic town of Tulbach. Overnight at guest house in Tulbach. Drive early to the nearby farm, Bergplaas, beneath Klein Winterhoek Peak. Hike up to the high bivy camp (3 hours) and relax the remainder of the day. Overnight at bivy, Klein Winterhoek Peak. Start early, scramble up to the start of the route (1 hour) and climb “Klein Winterhoek Frontal” (16) to the summit [12 pitches]. Descend to bivy. If time allows, pack up bivy and descend to the vehicle(s), returning to the guest house in Tulbach. If not, start preparing brews and evening meal at the bivy. Overnight either in Tulbach guest house, or at bivy site on Klein Winterhoek Peak. If still up at Klein Winterhoek bivy site, descend and drive to guest house in Tulbach, to refresh and to collect stored luggage. Drive into the Hex River Valley and through to Karbonaatjieskraal Guest Farm. Check in and then go climbing at the local crag in the late afternoon.Overnight at Karbonaatjieskraal. Drive through to Canetvlei Farm and hike up (max. 3 hours) to a bivy site in a spectacular setting on Milner Peak. Relax for the remainder of the day. Overnight at bivy site, Milner Peak. 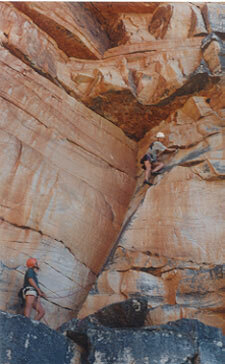 Slog up the scree slope, traverse across above the lower amphitheatre and continue up to the start of the route. Climb the “Milner Frontal Route” (16) to the summit. [9 pitches]. 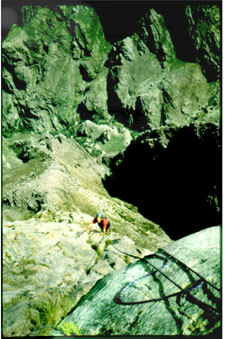 Descend to bivy site. Overnight at bivy site, Milner Peak. Rest day. Descend to vehicle(s) and drive, via Worcester to restock on supplies, to the central Cedeberg mountains. Overnight at self-catering chalets at Sanddrif on the farm Dwarsrivier. Leisurly rise, then pack up and drive to nearby Welbedacht and hike up to Cederberg Tafelberg in the afternoon. Overnight at bivy in Spout Cave, Cederberg Tafelberg. 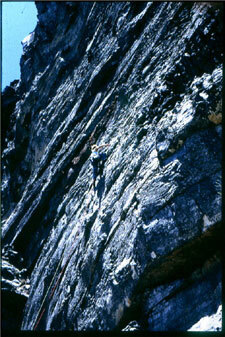 Climb “Cederberg Tafelberg Frontal Route” (12) [6 pitches], or more modern route(s) on the main face of Tafelberg. Overnight at Spout Cave bivy, Tafelberg. Climb on Cederberg Tafelberg in the morning. After lunch descend and drive to the town of Clanwilliam. Overnight in guest house in Clanwilliam. Drive to Wupperthal mission village then on to Heuningvlei in the northern Cederberg. Hike up to a bivy site on Great Krakadouw Peak. Overnight at Krakadouw bivy. Climb “Kakadouw Amphitheatre Direct” route (20) [10 pitches] up the centre of the main amphitheatre on Great Krakadouw Peak, or “Krakadouw Frontal Route” (15) or “Chimpanzee Tea Party” (18) up the ridge on the right of the amphitheatre. [Min. 8 pitches]. Overnight at Krakadouw bivy. Optional rest day, or more climbing either on the bigger faces of Great Krakadouw peak or the small crags of Middle Krakadouw. Overnight at Krakadouw bivy. Rest Day. Descend and drive via the hot springs in Citrusdal for a rejuvenating experience en-route back to Cape Town. Climb on Table Mountain, or the “Slangolie Direct Frontal Route” (16) [10 pitches] on Slangolie Buttress, one of the “12 Apostles” Buttresses on the west flank of the “Back Table” of Table Mountain. Overnight at guest house in Cape Town. Day at leisure until departure. This trip is suitable for climbers with a minimum of 4 – 5 years climbing and mountain experience, with a reasonable amount of that being on multi-pitch traditional routes (as seconder or leader), with fairly high level of mountain walking fitness.